Over these last few weeks, I have really dove into the world of Fables, devouring a multitude of volumes in the series and (almost) catching up to all those released. For this reason, I have decided to combine volumes for review. Today, I share with you Volumes 9-12, but first let's start with a very quick summary. 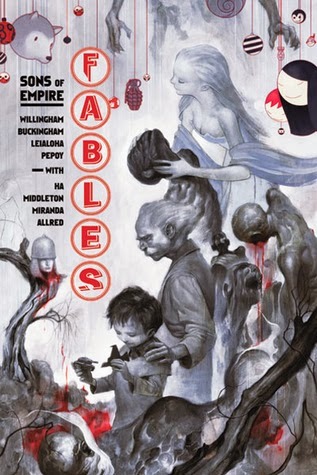 Fables is a graphic novel series created by Bill Willingham and a plethora of very talented artists, featuring characters from our favorite fairy tales from our younger years. However, this series is not for the young. It is a mature graphic novel series; the characters facing very complex obstacles, fighting to get back into their homeland instead of living secretly among you and me in our modern world. Now, to my latest reviews . . .
Sons of Empire really focuses on two of the main characters: Bigby the Wolf and Pinnocchio. We learn more about Bigby's relationship with his father and what direction it will go from here now that Grandfather North plays such a large role in the lives of Bigby's children. Pinocchio similarly tries to maintain his binds to his family, both his evil father and those left in Fabletown that grew to be like family during his exile. Sons of Empire is not my favorite of the series, but it does play a crucial role. Bigby and Snow are some of my favorite characters, so I was particularly drawn to these chapters within this volume. In this volume, Fly's tragic past is the focus. This previously miniscule character discovers that he was once the infamous Frog Prince. When his memory returns with full force, Fly takes a stand, setting dangerous plans into motion. The Good Prince is one of my favorites in this series. I adore when the underdog is finally sitting in the spotlight and Fly does not disappoint. 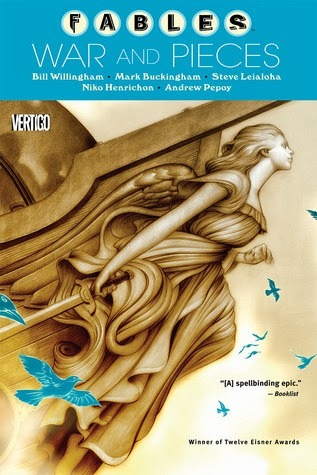 The Fables finally go to war in Volume 11. 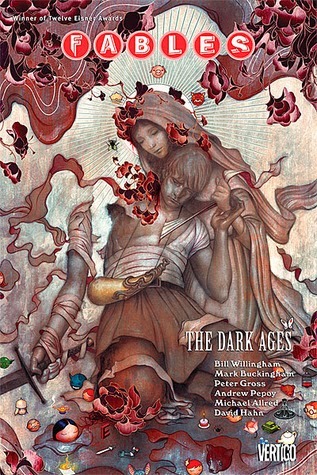 As with war, the reader can expect violence and casualties, and a war between two worlds is no exception; Fables unite, Fables strategize, Fables fight, and Fables die. War and Pieces is action-packed and filled with lots of suspense and a roller coaster of emotion. Many of the previous volumes build up to this war, and Willingham will have you turning the pages as fast as humanly possible. The war is over and it is time for the Fables to begin to pick up the pieces. Times are dark, as one can expect from the recovery of war. Those who remain discover that evil has really not been vanquished and a new enemy arises, bringing an even darker shadow to Fabletown. I expected the series to come to an end here, but it does not. A new story line has been created, and I was hesitant to see if the quality would remain. In short, Willingham does not disappoint. I'm hooked on the world, no matter the Adversary the Fables may be facing. Just as one challenge is overcome, we begin training for the next. And, the Fables have been doing this for centuries, creating so many stories to share. Are you a Fables fan? Which volume or story line is your favorite and/or least favorite? I LOVE this series. I'm not nearly as far as you though. Number 8 is my next one and then I need to read the Jack books. I've got The Hubster reading them too. I have a hard time picking a favorite volume. Every one has things I enjoy. So far I think I liked Mean Seasons because it rounded out Bigby's backstory and introduced his father. I still have a lot to read though so picking a favorite is a moving target. SuziQoregon ... I have most of the Jack books from the library right now to catch up on! Really, I love all the books, but there are a couple of volumes that really stand out to me. I mentioned one above, and when I review a few more (I think they are scheduled to post next week), I have another that really stood out. LOVE this series and will be sad to see it end. I fell out with Fables after the war ended -- maybe it felt like an anticlimax, the new villain being set up, or maybe I just had read too much Fables all in one go to keep on with a whole new storyline. I do want to pick it back up at some point though! I've heard that in the (oh heavens) three years since I stopped reading, there have been a lot of great plots. Jenny @ Reading the End ... I'm almost all caught up with the series at this point and I do agree that there are some really great plots since the war. I have ended up reading a large chunk of the books all at once recently. I haven't tired of it yet, but there have been authors and series that I have to give myself time between books or I burn out. Totally understandable! Hummm... I really like the Cinderella story line. I love reading her sides books. I am going to read Fairest next. Still can't believe the series is over. And the game.. The Wolf Among Us blew my mind. I still don't know what to think after playing it! My anxious life ... I have one of the Cinderella books right now from the library. I can't wait to read it! What's this about a game? I have not heard of this before. 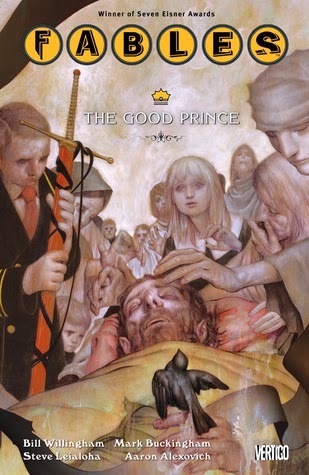 It's hard to keep them all straight (I've read 'em all, plus the Jack books & other stand-alones), but #10 (The Good Prince) is one of my very favorites. Getting to really understand Ambrose and his story is just so moving. But really, I love the whole series!